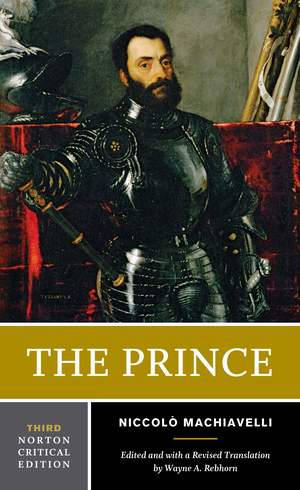 The Prince - Description | W. W. Norton & Company Ltd.
• Wayne A. Rebhorn’s thorough and thought-provoking introduction to Machiavelli, his world, and his famous political treatise (1513). • An accurate and highly readable translation, detailed explanatory annotations, and a map of North Central Italy in Machiavelli’s time. • A judicious selection of Machiavelli’s other writings that inform his immense influence as a diplomat, democrat, and correspondent. • Twelve interpretive essays from American and European sources, eleven of them new to the Third Edition. • A selected bibliography and an index. Read by more than 12 million students over fifty-five years, Norton Critical Editions set the standard for apparatus that is right for undergraduate readers. The three-part format—annotated text, contexts and criticism—helps students to better understand, analyse and appreciate the literature, while opening a wide range of teaching possibilities for instructors. Whether in print or in digital format, Norton Critical Editions provide all the resources students need.